No account yet? Registering is free, easy, and private. Discuss in the forum, contribute to the Encyclopedia, build your own MyAnime lists, and more. Apr 19 Manga Answerman - Does Manga Need An Anime Adaptation To Hit In The West? Apr 18 This Week in Anime - What's So Great About Fruits Basket? Strike Witches: 501st JOINT FIGHTER WING Take Off! We need your help. Good journalism costs money, and advertising doesn’t bring in what it used to. For just $1 a month you can help secure Anime News Network’s future. 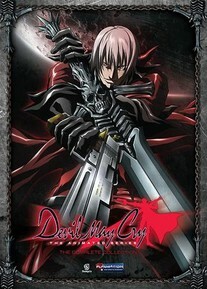 Cursed to live as both monster and man, Dante must spend his life fighting the demonic forces of darkness. Brandishing his sword, Rebellion, and his always-loaded guns, Ebony and Ivory, Dante is more than happy to send the demons back to hell - especially when there's money to be made. Special Features: Special Interview: Toshiyuki Morikawa (Dante), Devil May Cry: The Game Cut Scenes, Game E3 2007 Preview, Game Tokyo Game Show 2006 Preview, Game Trailers, Devil May Cry 4: Final 2007 Footage, Devil May Cry 4: Final 2008 Footage, Clean Opening Animation, Clean Closing Animation, Trailers. Spoken Languages: English, Japanese, English subtitles. Searching for the perfect new anime? The Spring 2019 Anime Preview Guide is here to help! Manga Answerman - Does Manga Need An Anime Adaptation To Hit In The West? This Week in Anime - What's So Great About Fruits Basket? Answerman - Why Do Funimation's Dragon Ball Z Re-Releases Look Like That? All material Copyright © 1998-2019 Anime News Network. All rights reserved.